Last week, the CDC released data proving what those of us in the birth activist community have noticed for years: home birth is on the rise. They evaluated home birth numbers from 1990-2009. After a decline from 1990 to 2004, the percentage of U.S. births that occurred at home increased by 29%, from 0.56% of births in 2004 to 0.72% in 2009. There are many reasons for this increase, from Ricki Lake and the Business of Being Born, to studies that show serious problems with our maternal and fetal mortality rate. Also midwifery is on the rise, and CPMs have been successfully pushing for recognition at the state level. To those of us who support the midwifery model of care and believe that leaving the hospital setting is a good idea for many low-risk births, this is great news. It’s also still disappointing that the overall percentage is so low–less than 1% of all births! Although when you look at it on a state level, there are places (like Montana and Oregon) where the rates are double the national average. For non-Hispanic white women, home births increased by 36%, from 0.80% in 2004 to 1.09% in 2009. About 1 in every 90 births for non-Hispanic white women is now a home birth. Home births are less common among women of other racial or ethnic groups. About 90% of the total increase in home births from 2004 to 2009 was due to the increase among non-Hispanic white women. The chart above shows just how dramatic the disparity is. I addressed some of my thoughts about what’s behind this gap in this post, which generated some good discussion in the comment thread. I think we’ll see that racial gap diminish when midwifery advocates include people of color in their work. When more midwives and doulas of color are leading these initiatives, and also when public funding for out-of-hospital birth care is addressed. 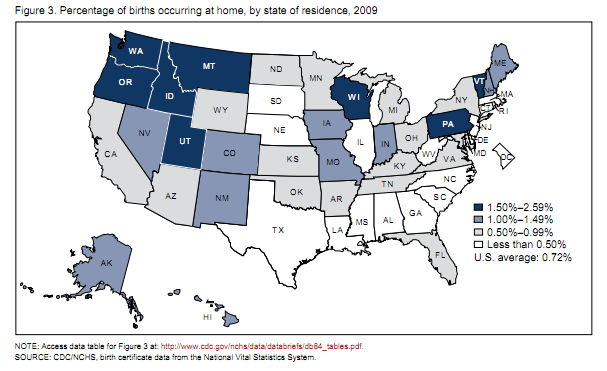 The percentage of home births was generally higher in the northwestern and lower in the southeastern United States. This Northern/Southern disparity is true for many health outcomes, and can probably be attributed to demographic differences, as well as a political climate that more favors midwifery and out of hospital birth in the Northwest. It’s clear we need more strong midwifery advocates in the South–and that would also be a place where it would make sense for people of color to take the helm. We know that a shift as radical as bringing maternity back out of the hospital is going to take decades. It was a decades-long, well-funded campaign that brought birth into the purview of doctors and hospitals to begin with. The good news is we are moving in the right direction, but if we leave women of color behind, we’re not going to achieve the wide-spread culture shift we’re working towards. Previous Article 42 volunteer doula programs and counting! I agree with you completely. Birth justice demands that women of color have true access to all birthing options. Part of the problem is that home birth midwives still do not have legal status in the majority of states you have highlighted, including most of the southern states. Even in those where out-of-hospital midwives are licensed to practice, such as Texas and Louisiana, the state Medicaid plan does not cover all midwives and/or requires the woman to obtain a physician sign-off before she can utilize Medicaid to pay for a home birth. A bill presently before the US House of Representatives (H.R. 1054) will require all state Medicaid plans to include Certified Professional Midwives (CPMs — the midwives whose education specifically prepares them for out-of-hospital practice in homes and birth centers). In 2010, Congress extended a Medicaid mandate to include birth centers and CPMs when they provide services in birth centers. This bill will add home birth. So, if a woman is on Medicaid but wants to give birth in a birth center, her state Medicaid plan is required to cover the bill for both the birth center and the midwife, if licensed in that state. If you have read this excellent blog and want to know what you can do and how you can help, a first step would be to call your federal Congressman’s office both locally and on Capitol Hill (you can google for a search engine to find out who represents you in Washington, D.C. and how to call him or her). As for the Congresswoman’s/man’s health aide, and then tell that aide that you are a constituent and want him or her to become a co-sponsor of HR 1054, so that states will be required to provide Medicaid coverage for CPMs and home birth. We need more women, including more women of color, to work with state advocacy organizations in these states that work to legalize out-of-hospital midwives through the Big Push for Midwives. State groups such as Alabama Birth Coalition, Mississippi Friends of Midwives, North Carolina Friends of Midwives, Mamas of Color Rising and Texans for Midwifery in Texas would love to have more members. Please look for links to them on the website of The Big Push http://www.pushformidwives.org. Click on the What We Do tab to go to the Big Push Map showing which states presently license home birth midwives as well as the status of legislation in several other states. The site also contains links to the websites and facebook pages of our state member groups of midwives and of citizens working for midwife and birth center licensure and Medicaid coverage of both of these options..
We also need to make midwifery education more accessible to women of color so the pool of home birth midwives will more truly reflect the diversity of American mothers and babies. While some midwifery schools can be very expensive, many women become certified professional midwives through an apprenticeship route combined with online clinical studies. A new trend is the opening of CPM programs in community colleges where the tuition is more affordable and thus more accessible to more women than many private programs or the graduate level educational requirements imposed on those who become nurse-midwives. Wisconsin opened such a community college program a couple of years ago and Louisiana State Community College in Lafayette just opened its doors to its first class with the start of spring semester last month. More such programs are in the works. Bringing midwifery and home birth as a true option for all American women involves hard work and persistence, but organizations exist and infra-structure is being developed. We need more women and families to join with us in these endeavors. Thank you for this information. I am due in April. My husband and I were trying to find a doula or midwife on the South. I cannot tell you how disheartening it was and the looks we received. I would like to help support this movement anyway possible. As a woman and mother of color I think it is very necessary for us to educate ourselves on motherhood and overall a healthier way of living and raising the next generations to come ❤ please keep me posted! Thanks. Thanks for your comment Christine. If you’re still looking for a midwife or doula, I’m happy to try and help my posting here. 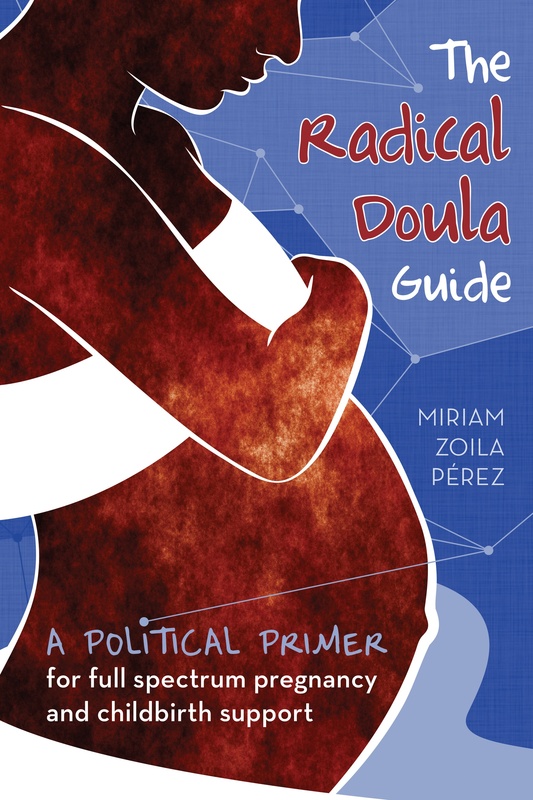 If you sent me, either via email (radicaldoula@gmail.com) or here in comments, where you are located and what you are looking for, I can post to see if anyone reading here knows a doula or midwife in your community. I know it’s harder in the South, but not impossible! For many women, health insurance and medical coupons simply do not pay for homebirth and doula care. Many immigrant women come from countries where hospital births have high status, and homebirth is considered what the poor do. That cultural norm is not easily let go of. I am a grandmother, and we were talking about this in the 70’s. The basics have not changed; as with so many social issues, racial and economic justice are at the foundation of creating equal access. Thank you for this posting. We provide volunteer doula services for refugee and immigrant women here in Canada, and our intervention/cesarean rates are awful compared to the private practice doulas, who serve mostly white middle-class women. I see racism and classism all the time in the hospitals here, and I know that my white middle-class appearance is helpful (for all the wrong reasons) for these clients. Keep up the radical work! This makes me so sad…..